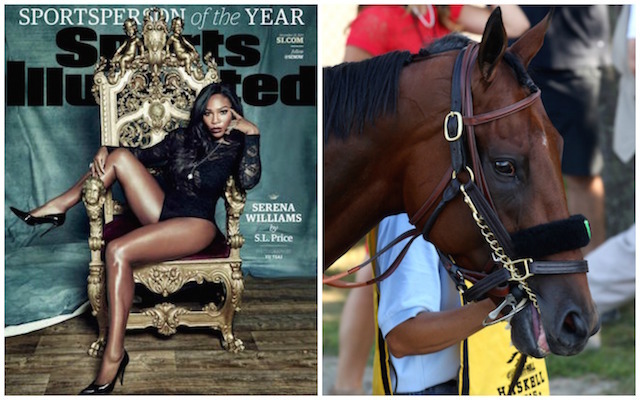 Horse fans are actually livid that superstar tennis player Serena Williams won Sports Illustrated&apos;s "2015 Sportsperson of the Year" award, beating out American Pharaoh, who, let&apos;s be clear, is a horse, not a human capable of being a sportsperson. The Los Angeles Times took it a step further this morning, writing a comparison between the two, and ran a poll asking its readers if they think Williams or the horse should be the "real sportsperson of the year." @hellresidentNY I can&apos;t believe someone at @latimes thought it was a good idea to pit a black woman against a horse for "Sportsperson." Even though American Pharaoh won SI&apos;s reader poll for Sportsperson of the Year, the magazine announced the 34-year-old Williams as their own pick. Last month, when SI revealed their 12 contenders, which included everyone from NBA player Steph Curry to UFC fighter Ronda Rousey and the entire Kansas City Royals team, they oddly included American Pharaoh in the mix, saying the "3-year-old colt ended a 37-year Triple Crown drought with a huge win in the Belmont Stakes—the 12th Triple Crown winner in history." But they didn&apos;t purely pit Williams against the horse. To be fair, American Pharoah is not just any horse. He is horse racing&apos;s first Triple Crown winner in 37 years. And he won the magazine&apos;s readers&apos; poll for the award. Of course, a strong argument can be made for Serena as well — one that goes beyond the obvious points that the award is called the sportsperson of the year and only humans have won it since its inception in 1954. Williams won 53 of the 56 matches she played this year, including three of the four Grand Slam events, and held the No. 1 spot in the WTA rankings every week. But we are honoring Serena Williams too for reasons that hang in the grayer, less comfortable ether, where issues such as race and femininity collide with the games. Race was used as a cudgel against Williams at Indian Wells in 2001, and she returned the blow with a 14-year self-exile from the tournament. She returned to Indian Wells in ’15, a conciliator seeking to raise the level of discourse about hard questions, the hardest ones, really. Williams, S.L. Price writes in his cover story in the Dec. 21 issue, “proffered an open hand. Far past the time that anyone expected it, she demonstrated a capacity for change—innovation if you will. She’s groping for answers and realizing she has much to learn. She was a difference-maker in other areas, speaking out against bodyshamers in both words and actions, posing for the Annie Leibovitz-shot Pirelli calendar in only a bikini bottom. The cover shot of this issue? Her idea, intended, like the Pirelli shots, to express her own ideal of femininity, strength, power. Her curiosity was ravenous, as she enrolled in an online history of civil rights class at UMass, guest-edited the October issue of Wired and announced her return to Indian Wells in an essay in SI’s sister publication, Time. @latimes We’ve changed the headline and photo on this story to treat it with greater sensitivity. Thank you for your feedback.